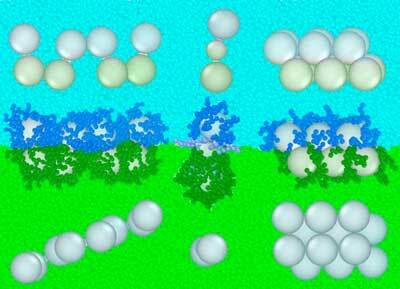 (Nanowerk News) Materials scientists at Duke University have theorized a new "oil-and-vinegar" approach to engineering self-assembling materials of unusual architectures made out of spherical nanoparticles. The resulting structures could prove useful to applications in optics, plasmonics, electronics and multi-stage chemical catalysis. The novel approach was published in the journal ACS Nano ("Interfacial Assembly of Tunable Anisotropic Nanoparticle Architectures").